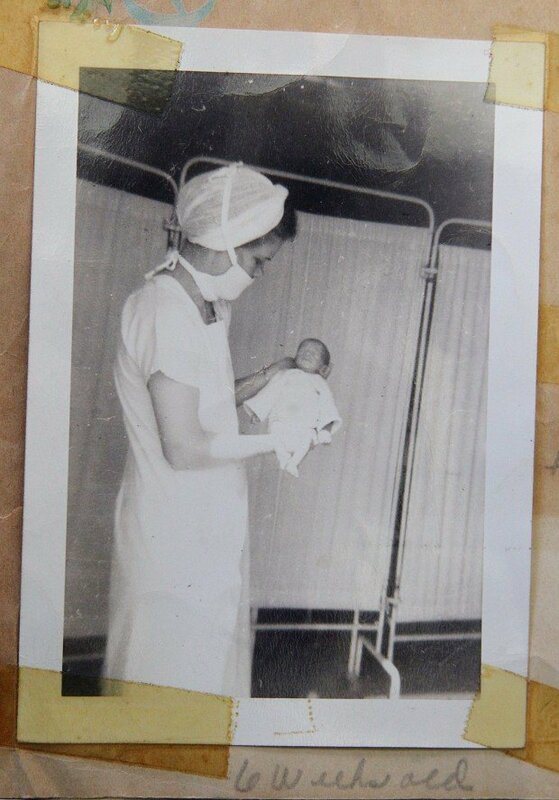 Margie Long was a 24-year-old nurse when she held the smallest baby she’d ever seen. It was Jan. 31, 1947. Little Sharon Lynn Kaiser weighed just 1 pound, 14 ounces, measuring 12 inches long. She had arrived more than two months early and was delivered by Caesarean section. Doctors didn’t think she’d survive more than a day. Long had become a nurse to help people. She knew that baby needed help, and she devoted herself to caring for the newborn during her 73-day stay at Suburban Hospital in South Gate, Calif.
“She looked like a rubber doll,” Long said Thursday as she and that grown baby — now a 66-year-old great-grandmother whose married name is Sharon Bolles — sat on the couch of Long’s home in De Soto. 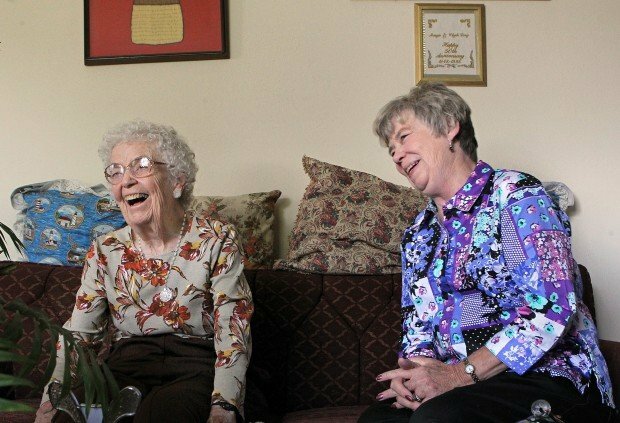 In the decades since Bolles’ birth, the two have shared a bond experienced by few nurses and patients. They have corresponded by letter and phone while separated by thousands of miles, and have enjoyed the occasional face-to-face meeting. “She never, ever missed my birthday or Christmas,” Bolles said of the cards from Long, whom she credits with saving her life. She has cherished those cards and letters. Now, they talk on the phone at least once a week. Bolles drove from her home in Tulsa, Okla., to visit Long on Thursday. She brought mementos. They looked at old pictures, including one of Long cradling Bolles as her parents beamed, as well as photos of other visits through the years. And Long, now 89, told of Bolles’ tenuous first months, when that bond began. Long — who grew up in St. Patrick, Mo., and took the job in California while visiting a cousin there — remembers feeding Bolles a teaspoon of breast milk from a medicine dropper every hour. A newspaper article reported Bolles gained three-quarters of an ounce each day during the first three months. Long recalled that she cut a cloth diaper so it was small enough for the tiny baby. She constantly worried that Bolles wasn’t warm enough, and hurried to feed, bathe and dress her, keeping her wrapped in a blanket. Long remembers that incubator — it was a bassinet with a 5-gallon jar of water beneath it. Two 500-watt bulbs heated the water, and a sheet covered the top of the bassinet to keep Bolles warm. An oxygen tube ran beneath it so she could breathe. Bolles said Thursday she had never heard that description. Long remembers the two blood transfusions Bolles received, when she worried the baby wasn’t going to survive. And she remembers Bolles’ twin sister, Augusta Lee, who died hours after birth. The record for the lowest birth weight of a surviving infant is held by Rumaisa Rahman, who weighed 9.17 ounces — about a third of Bolles’ birth weight — when she was born in 2004, according to Guinness World Records. Bolles weighed 5 pounds, 11 ounces when she was discharged from the hospital. She kept the hospital bill from her stay. It was $597 — that included a $3 per-day charge for 73 days, another $256.50 for 19 oxygen tanks, and $55 for blood, plasma and transfusions. The two reunited for the first time when Bolles was 1 year old. “She was still on the tiny side,” Long said. Bolles would never be big — she weighed 33 pounds at 5 years old, and was just 110 pounds when nine months pregnant with her own daughter, she said. Long moved to De Soto in 1959 after being stationed with her husband, who was in the Navy, around the country and in Panama. She worked as a nurse for the Jefferson County Health Department for 18 years. The two met again in 1969, when Bolles’ husband was stationed at Scott Air Force Base, and again in 2006 when Long passed through Oklahoma on her way home from a trip to Texas. Thursday was their fourth get-together. Long told her grandson that “my preemie” was coming to visit. Bolles certainly wasn’t the only premature baby she’d cared for during her nursing career, but Long didn’t need to explain any further. “He knew who I was talking about,” she said. Still, neither can quite explain why their connection has endured.